Teppelin begins to collapse. Also it begins the final battle against Lord Genome. Darling In The FranXX Season 2 release date: DarliFra anime spawns a manga, but will Zero-Two return for a second act like Tengen Toppa Gurren Lagann? How many episodes of Tengen toppa gurren lagann have you seen? A psychic middle school boy tries to live a normal life and keep his growing powers under control, even though he constantly gets into trouble. Kamina: Who in the hell do you think I am? 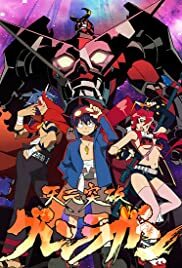 Tengen Toppa Gurren Lagann is the pinnacle of anime insanity. No Dragon Ball or super robot show can come close to the ridiculousness of TTGL. It breaks the record, then reaches a million miles further. Its so over-the-top that any anime that would try to beat it would only chase its coat tails. But what really makes TTGL one of the best is its controlled juuuuust enough for you to take it seriously. It isn't amped to 11 every episode. Its well-paced, and gradually progresses. The characters are very likable, the animation is solid, and the music is great! The best moments of the show are perfectly executed, working on so many levels. Its more than gigantic explosions and drills. You'd have to be a sworn enemy of fun to hate TTGL. Its awesome, but emotional too. Its easily one of my favorites. Final note - The movies are mostly rehashes of the TV series. But the final battle...well, let's just say it managed to top itself, somehow. See the second movie's ending for the stunning conclusion to the series, skip the rest. 12 of 16 people found this review helpful. Was this review helpful to you?